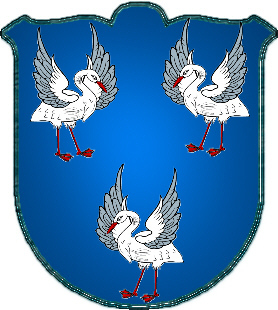 Coat of Arms: A blue shield with three storks rising. 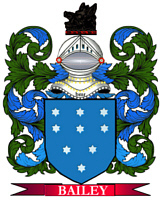 Crest: Out of a ducal coronet a lion's gamb grasping a club. Motto Translated: Just and faithful. 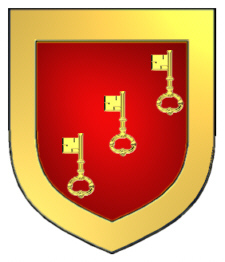 A red shield with three gold keys, and a gold border. Gamb, Gambe or Jambe. The whole fore leg of a beast. If couped, or erased near the middle joint, it is called a paw. Ducal Coronet. Is depicted with three strawberry leaves. With more, they must be named. e.g. a Ducal Coronet of five leaves. 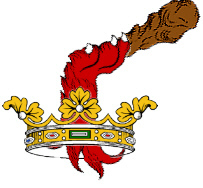 The Ducal coronet has recently received the name of Crest-Coronet.